So on top of all the Hugo Award related reading I’m doing, I’m reading a good bit of other fiction as well, and I think I’ve found a book I plan on voting for next year. (Can’t afford to vote this year, but considering that Worldcon is in Spokane, Washington next year, I definitely plan on going. The really amazing thing? I’ve hated Jane Austen’s books with a passion for years. (Enjoyed her writing style, but the books turned me off very, very quickly.) So the fact that these books actually have me excited should really tell you something about them. The writing is fantastic, the plot is paced amazingly, I use too many superlatives… The characters, though, are the shining points in the book. So many excellent books have protagonists that are strong, intelligent, and purposeful, but they often feel… well, square peg in square hole. They often feel somewhat undeveloped, like a suit of clothes that the reader is meant to fill. 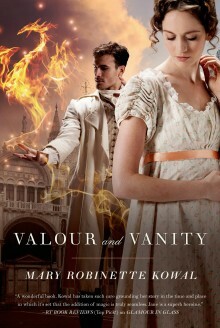 Mary Robinette Kowal’s characters are absolutely fantastic, though. They’re flawed, filled with doubt, and very human- but at the same time able to overcome those flaws, help one another to exceed themselves, and extraordinarily capable. The magic system is pretty awesome, too. It reminds me very much of Brandon Sanderson’s detailed magic systems, which is not surprising, since the two are good friends and are both on the podcast Writing Excuses, which every aspiring author should be listening to. Anyhow, the magic in the book is purely limited to illusions- sight and sound. It has a lot of limitations, but it allows for some awesome shenanigans in the heists. Definitely check the book out. The year is still young, so who knows what will happen to my list of nominations, but for now, Valour and Vanity is definitely on it. Posted in Great Hugo Readthrough and tagged Brandon Sanderson, Hugo Award, Jane Austen, Mary Robinette Kowal, Sasquan, WorldCon, Writing Excuses on May 7, 2014 by mountainwashere.